Craving for Filipino food? 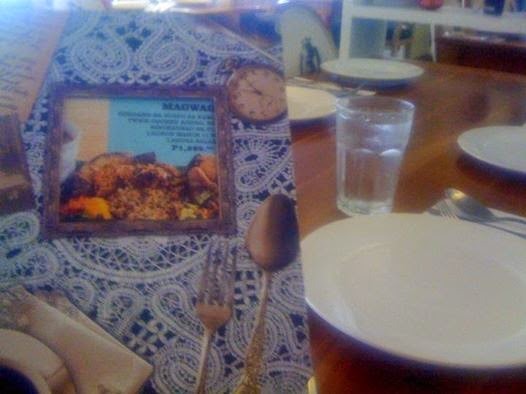 Dekada Historic Filipino Cuisine is one which you definitely have to try. As the name suggests, Dekada Historic Filipino Cuisine restaurant is decorated with vintage items and historical momentos every Filipino can relate to. The Magtagumpay Family Platter (P 2,199 pesos) consists of Kare-Kare, Dilis Rice, Bangus ala Pobre, Crispy Pata, Inihaw na Manok, Garlic Sugpo plus steamed vegetables (okra and eggplant). Dekada brought the concept of the Philippine military boodle fight tradition to its restaurant. Food was served and spread on banana leaves. And just like in the true spirit of a fight boodle, each one of us worked to dig in and get our fill from mounds of food! We enjoyed the hefty spread and had fun. The big servings of Magtagumpay Family Set are really made for sharing. We had a taste of the distinctively Filipino boodle fight experience at Dekada! For dessert, we had Halo-Halo and Palitaw. The Halo-halo we all Filipinos love is made perfect by Dekada. This cold dessert with brightly-colored ingredients made of tropical fruits and preserves is topped with a cherry plus scoop of ice cream. Had fun sharing this festive dessert! Next came in Dekada's Palitaw, which was served with Muscovado sugar, sesame seeds and freshly grated coconut. The glutinuous rice cake was served warm. This relatively bland, chewy dessert gets it flavor from it into the grated coconut, excellent brown sugar mixture combined with fresh sesame seeds that have been toasted. The latter gives it a crunchy texture. 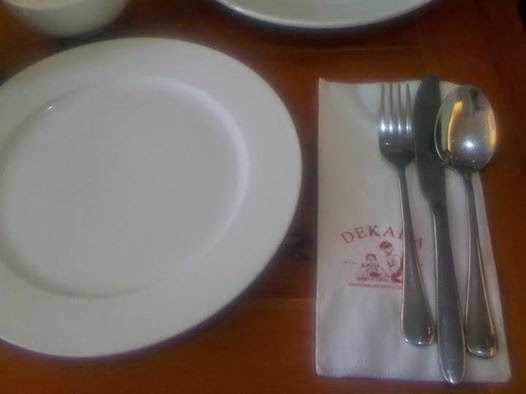 Your group dining experience will never be the same at Dekada Historic Filipino Cuisine. Very good value for money! wow wow wow reminds me of a fiesta, the boodle platter looks delish! The Magtagumpay Family Platter is really festive! wooow that looks yum! A bit expensive though but I hope it's worth it. Looks pricey but only boils down to less than P 300 per head when 7-8 individuals share. I love boodle! My boys like the boodle food fight concept!!! I love the kare-kare (drooling mode)! I haven't tried boodle food fight concept but will definitely try soon at home! I had a bad experience at Dekada. :( Poor service. Pero the food is yummy nga sana. Sorry to hear about that. We did not encounter any problem at the time we dined in. The courteous staff were attentive. Everything looks good especially the Kare Kare. Yum! OMG, kare kare!!!! looks delish, mommy! Kare-Kare is my favorite as well. Kare Kare! Yummy! Thanks for sharing! So hungry now! Noms! Nothing beats the Filipino cuisine indeed! I love the food at Dekada. The servings are hefty too. Two thumbs up!